Set on a land of 800m2, Gallion Villa is a four-bedroom luxury villa designed to accommodate eight guests. 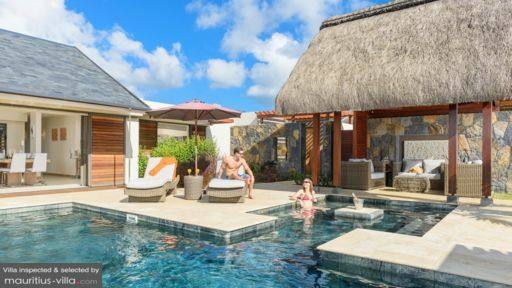 Boasting exquisite opulence that can easily rival 5-star resorts, this villa features just about everything you need to enjoy a relaxing holiday with friends or family. From a massive emerald green garden to a refreshing swimming pool, Gallion Villa is entirely self-catering. Guests are also offered a daily free shuttle service to the Beach Club. 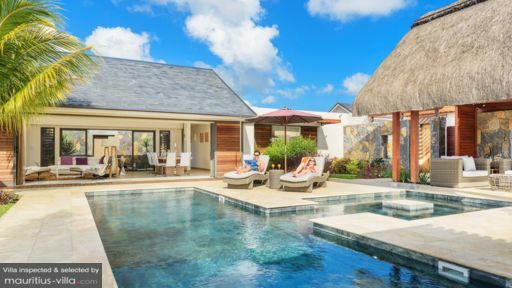 Aptly located near some of Mauritius’ major cities, this villa has been entirely designed to create an oasis of peace and tranquility. Fully air-conditioned, the master bedroom has a wide double bed to ensure a restful night’s sleep. Equipped with a dressing area and safe, the bedroom also has its en-suite bathroom with shower, toilet, mirror and double sink. The master bedroom overlooks the garden and also includes an armchair as well as a flat-screen television. This particular bedroom also has its own private deck with an outdoor hot tub. Gallion Villa additionally has three bedrooms to accommodate your guests. Each guest bedroom is equipped with a double bed each. If you have an extra guest staying over, it is possible to add an additional mattress for a supplement. All guest bedrooms have their own en-suite bathrooms with shower, sink, toilet and mirrors. They are fully air-conditioned and have a dressing. Enjoy warm tropical evenings in the great outdoors as you dine Al Fresco under the gazebo. Barbecue facilities and furniture have also been set up for fun evenings with your close ones. During the day, lounge back on one of the sun beds that have been strategically placed around the garden to help you work on your tan. 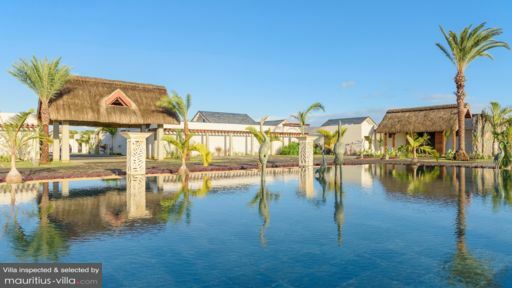 Indeed, Gallion Villa is famous for its lush tropical garden which is brimming with palm trees, shrubs as well as a variety of flowers and plants that are unique to Mauritius. More importantly, the garden contains a wide and refreshing swimming pool that measures 10m x 3m. This private palm-fringed pool opens on a smaller swimming area of 3m x 3.6m, which is ideal for children. Gallion Villa has a spacious living area that has been arranged to create an accommodating and homely atmosphere. Airy and contemporary, the living area comprises of a wide living room with ceiling fan to ward off the tropical heat. In the living room, you will also find a flat-screen television, coffee table, armchair and an L-shaped sofa. The open-plan living room also includes a dining table which can seat eight people. Because the villa is self-catering, you will be in charge of your own meals, unless you opt for cooking services as supplements. The good news is that the kitchen does include everything you need for a comfortable cooking experience: from the fridge to the microwave or even gas stove and the sink, you can make the most out of the amenities and included utensils. As a guest at Gallion Villa, you can benefit from different types of amenities and services to ensure that you’re pampered and well-taken care of during your holiday. As a result, the villa offers you a complimentary housekeeping service, 7 days a week. Indeed, a maid will come in as a daily basis to take the cleaning and laundry. As a supplement, the maid can even take care of the cooking. Wake up to the glorious scents of a continental breakfast every morning as the maid brings you a hamper full of jams, one pastry per person, tea, coffee and fruit juice. It is also possible to opt for supplements such as eggs, bacon and sausages at an extra fee. If you have kids, don’t hesitate to contact the concierge to hire a trained babysitter who can take the children off your hands for a few hours while you enjoy some much-needed alone time. Some additional A La Carte services include- but are not limited to- airport transfers, car rental, grocery delivery, In-House Chef, Maid Cooking and excursions among others. If you want to savor a gourmet meal, head over to the world-class Archipel des Saveurs restaurant which is a mere minute from your villa. Alternatively, you can also check out 5 Sens, a 5-star spa where you will be pampered to your heart’s delight. If you want to enjoy some traditional island nightlife, head over to the coastal village of Grand Bay which contains a variety of nightclubs, restaurants and casinos.